Greta Garbo may have famously said “I want to be alone” but in the human psyche nothing could be further from the truth. We all want to belong – to our families, our group of friends, our teams, society at large. The ALS/ MND campaign is a perfect illustration of this. I have watched with interest over the last few weeks, as the campaign continues to snowball, to a point where people are now starting to criticise the campaign’s high profile takeover of their Facebook and Twitter feeds. Whilst no-one is denying how great the ice bucket challenge has been to raise awareness of a lesser known disease area, it seems there are now calls for people to donate in humility without the accompanied social media post. But cynicism aside, these people are overlooking the fundamental reality that we humans are social animals. In the hierarchy of needs, we search for community; we need to fulfil our urge to belong, so to donate without pouring the obligatory bucket of water over our heads and recording the jest for all to see disconnects us from the cause. It’s about being part of something. 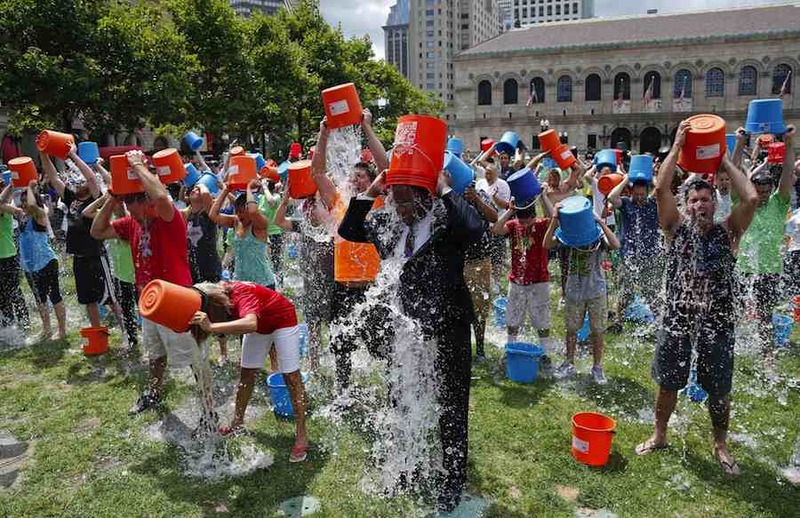 So, what lessons from the ice bucket challenge can be applied to branding? Wise brands tap into that universal desire for community by inviting people to participate in a larger story that in turn gives them a sense of shared identity. Feelings are the catalyst for action, and storytelling is the perfect vehicle to engage people’s emotions. Wise brands use the power of storytelling to make their customers care about them – give them a reason to want them, love them and champion their cause – something we’ve discussed before in relation to creating compelling fundraising campaigns and not for profit digital communications. Apple is often held up as the gold standard in branding for many reasons, but which other phone manufacturer has people queuing around the block, in multiple countries, even camping out the night before to get their hands on the latest handset? The desire to be part of the Apple community is a strong one. P&G’s “Thank You Mom” 2012 Olympic campaign was a defining moment in emotional connection. From the early morning wake-up calls to the training sessions in subzero temperatures, years of steadfast devotion were jam-packed into 30 seconds. In that half-minute, P&G went from being a faceless multinational to winning the hearts of countless parents across the globe, turning them into customers for life. From advertising campaigns that demonstrate that nobody understands you better, to NikeiD putting you in the driving seat of product design and Coca-Cola’s product-led ‘Share a Coke’ campaign, the ways in which you can involve your target audience with your brand are many and varied. They all have one thing in common though: they celebrate individuality as part of a wider community.